Reid’s staff has told anxious liberals that Lieberman has given the Democratic leader assurances that he will not wreck the reform bill because of Reid’s decision to include the public option, according to two sources briefed on the issue. Sen. Joe Lieberman (I-CT) […] just gave his Democratic colleagues some breathing room. Lieberman said he’s open to both the Medicare buy-in idea, and a separate proposal to extend the private system that insures federal employees to individuals and small businesses. 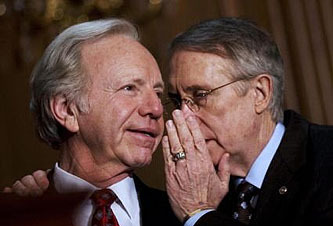 I wonder how Reid’s lifelong friendship with Lieberman is faring tonight?